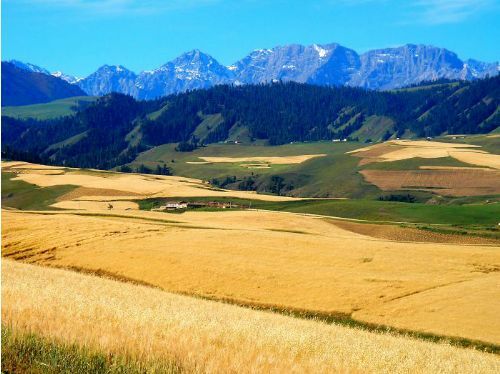 Situated in the center of Xinjiang, Changji Hui Autonomous Prefecture is bounded on the east by Urumqi and Hami in neighborhood of Turpan in the south, while Mongolia lies to the northeast of the prefecture. China's central government of the day extended its sphere of influence to Changji with the establishment of the Protectorate of the West Region (Xiyu Duhufu) in 60BC during the Western Han Dynasty (206BC-24AD). In 1884, a province was set up to administrate Xinjiang, and the Changji region belonged to Dihua Fu. The prefecture lies at the foot of the Tianshan Mountains on the southeastern edge of the immense desert in the Junggar Basin. The terrain in which Changji is situated inclines to the south and is part of the hinterland of Asia. Basking in a continental climate, the prefecture has characteristically dry weather with great temperature variations between day and night. To the south, there are the obvious climatic features of the mountains, while to the north there is the typical climate of a dry desert. The average annual temperature is 6.8℃ (44.2℉). The transitional spring and autumn seasons between summer and winter, are short. When to Go: Summer and autumn are the best seasons in which to visit Changji. By avoiding the burning sun at noon, the summer in Changji can be refreshing. Local Highlights: Hua'er refers to the most popular folk songs of the Hui people. These are native to the area around Ningxia, Gansu and Qinghai province and later included Changji. The irregularly held folk song festivals attract the participation of many local singers. Corban Festival and Ramadan Festival are the festivals for the Uygur, Kazak, Hui and many other ethnic minorities who are followers of Islam. Bogda Feng is the highest peak in the eastern part of the Tianshan Mountain range. Situated in the south of Fukang County it has an altitude of 5,445 meters (17,864 feet). The distances as the crow flies, from the peak to Urumqi and the Fukang county seat, are 60 and 49 kilometers (37 and 31 miles) respectively. It is one of the fifteen peaks of Xinjiang open to tourists. Tianchi Lake, like a silver mirror, lies in the valleys below Bogda Peak, and was included into the Bogda Biosphere Reserve in 1990. The lake water is supplied by the melting ice and snow running off the surrounding peaks, and remains cold even in midsummer. Consequently, the lake is a well-known summer resort for the people of Xinjiang. 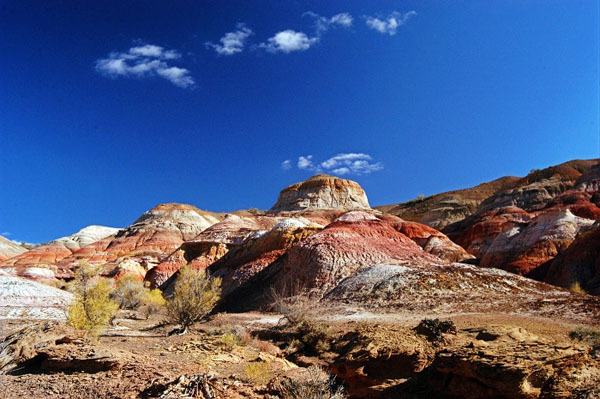 Wucai Wan (Five-Color Sinus) is a colorful and astonishing desert landscape in the north of Jimsar County. The coal beds exposed to the air burned out due to lightning and the strong sunlight. The fanciful scenes and the desert scenery make the Wucai Wan appear like a modern painting shining with bright colors. 1. Changji is 38 kilometers (24 miles) from downtown Urumqi and 18 kilometers (11 miles) from Urumqi International Airport. Changji Railway Station is located 10 kilometers (6.2 miles) south of Changji city proper. In addition, the prefecture's central bus station is located in Wuyi Lu. 2. There are two optional routes for the climb to Bogda Peak. Melons, hops, grapes, Fernle mushrooms, roast lamb, roast whole sheep, hand-made yellow noodle.